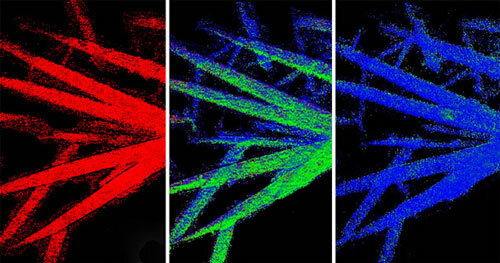 (Nanowerk News) In a move that could improve the energy storage of everything from portable electronics to electric microgrids, University of Wisconsin-Madison and Brookhaven National Laboratory researchers have developed a novel X-ray imaging technique to visualize and study the electrochemical reactions in lithium-ion rechargeable batteries containing a new type of material, iron fluoride. Graduate student Linsen Li worked with Jin and other collaborators to perform experiments with a state-of-the-art transmission X-ray microscope at the National Synchrotron Light Source at Brookhaven. There, they collected chemical maps from actual coin cell batteries filled with iron fluoride during battery cycling to determine how well they perform. The results are published in the journal Nature Communications ("Visualization of electrochemically driven solid-state phase transformations using operando hard X-ray spectro-imaging"). Some implications of this research are obvious — like using portable electronic devices for longer before charging — but Jin also foresees a bigger and broader range of applications. The experiments were performed with the help of Yu-chen Karen Chen-Wiegart, Feng Wang, Jun Wang and their co-workers at Beamline X8C, National Synchrotron Light Source, Brookhaven National Laboratory, and supported by the U.S. Department of Energy Basic Energy Sciences and a seed grant from the Wisconsin Energy Institute. The synthesis of the battery materials in Jin's lab was supported by National Science Foundation Division of Materials Research.